“Japan, Off The Beaten Path” is a travel essay series by Susan Spann, author of the Hiro Hattori mystery novels. She visited Tokyo's Izu Oshima Island in March, where she explored impressive volcanoes and relished beautiful camellias and cherry blossoms. The volcanic island of Oshima rises from the sea 120 km south of Tokyo. Although best known for its winter-blooming camellias, I visited in early spring, when the weather was right for visiting Oshima’s other famous feature: Mount Mihara (Miharayama). The live volcano rises at the center of the island and acquired pop-culture fame when it featured in two Godzilla movies, as well as the Japanese horror novel Ring. An avid volcano climber, I looked forward to standing on the summit and looking down into the smoking crater. Early on a Saturday morning, I boarded the Tokai Kisen jetfoil ferry for the 90-minute journey to Oshima. Jetfoil ferries use jet engines to travel above the water’s surface, reaching speeds of over 70kph, and I’d like to claim I enjoyed the ride, but the smooth hum of the engines put me to sleep almost immediately. However, I enjoyed the nap! I woke up as the ferry docked at Motomachi Port, on Oshima’s western coast. The island has two ferry ports—Motomachi and Okata—with the port of arrival decided daily based on the weather. I was delighted to land at Motomachi, the closest port to my hotel and to the Mt. Mihara trailhead. Unfortunately, I took too long storing my suitcase in a locker (I should remember to carry change!) and missed the first bus to the trailhead. Rather than wait another hour, I hopped in a taxi for a 15-minute ride up the Oshima Skyline, a scenic road with spectacular views of the ocean and the coast. The taxi driver also pointed out the new Memorial Park and the blooming wild yamazakura (mountain cherry) trees. At a distance, their puffy white flowers looked like giant popcorn kernels. Close up, their delicate petals were so beautiful that I could have gazed at them all day—except that I had a volcano to climb. From the trailhead, I hiked across a long, flat valley and up the steep, curved path to the summit. According to the trail map, it takes an hour to reach the crater rim, but the pleasant, overcast day and my excitement made me move much faster. Thirty-five minutes after leaving the trailhead, I stood before the wooden torii (sacred Shinto gate) at the entrance to Mihara Shrine, which honors the deities of Mt. Mihara. After visiting the shrine, I continued along the rocky path around the crater rim. As I hiked, I looked at the rocky shoreline far below me and, beyond it, at the ocean swells that mirrored the gray of the cloudy sky. A fresh sea breeze carried away the sulfurous smell of the fumaroles (volcanic vents) that sent up plumes of smoke from various places near the crater. After circling the crater rim and looking in from the highest point (with no sign of Godzilla) I climbed down the far side of Mt. Mihara, hoping I’d have time to climb a smaller neighboring mountain called Mt. Kushigata (Kushigatayama) and still catch the final bus back to Motomachi. The barren surface of Mt. Kushigata felt almost like hiking on the surface of the moon or Mars (though, fortunately, with oxygen). On the summit, I reveled in the spectacular views of Mt. Mihara and the surrounding lava fields. A second check of the trail map revealed that I didn’t have to race for the bus at the Miharayama trailhead. Instead, I followed another trail across the lava fields to the bus stop at Miharayama Onsen—another bonus. After the ten kilometer hike, I was more than ready for a soak in a hot spring bath. I woke up early Sunday morning, hoping to visit the Oshima Zoo and the island’s famous camellia garden before my afternoon ferry back to Tokyo. The day dawned bright and warm, but very windy. The ocean was whipped into meter-high waves that exploded into spray against the breakwaters near the shore. As it turned out, the windy weather had done me another favor: the ferry port had shifted to Okata, the closest port to both the zoo and the camellia garden. I left my suitcase at the Okata tourist office and hiked up the hill away from the port in search of Shima-Jima, a bakery I’d discovered on Google Maps the night before. I ended up on a residential street, and was about to turn back, thinking I was lost, when an elderly woman emerged from a nearby house with a bag of pastries in her hand. She smiled and gestured to a small sign on the house that read “Shima-Jima” in Japanese. Inside, the entry had been converted into a tiny pastry shop, with baskets of golden pan sale (a tender salty bread), fragrant cinnamon rolls, and rows of hot dogs wrapped in flaky crusts. I made my selections and returned to the port, where I found an empty bench and enjoyed an open-air breakfast with a spectacular view of Mt. Fuji rising on the far side of the white-capped waves. After breakfast, I headed off to the Oshima Zoo. The zoo’s location on a coastal hillside dotted with blooming sakura and camellia trees made it beautiful as well as fun to visit. I arrived at the enormous walk-in aviary just before feeding time. The flamingos followed the keeper around as he cleaned the pond, but the crafty peacocks sneaked around behind him to steal an early breakfast from the buckets of food he left beside the gate. Farther along the path, another keeper visited with the Bactrian camel, who seemed to enjoy his company, and three adorable red pandas munched a meal of bamboo leaves. Later, I visited the massive camellia garden, which features more than three hundred different species of camellia trees. Camellias normally bloom between late December and early March, but a surprising number were still blooming when I visited. Better still, the park was filled with the spectacular pink and white blossoms of cherry trees. I was the only visitor that morning, so I got to enjoy a private hanami (flower viewing). 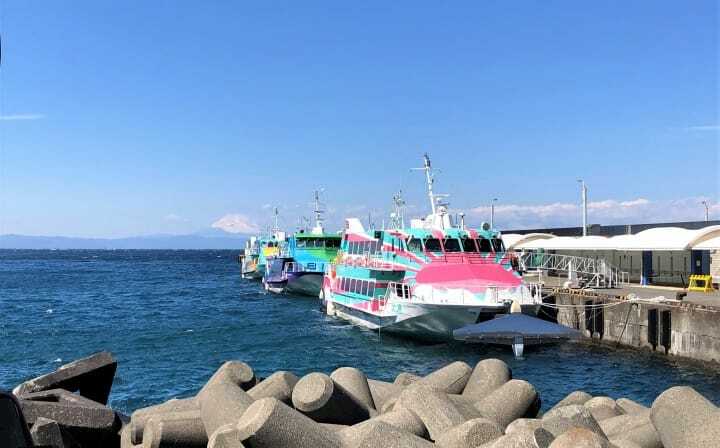 When I boarded my jetfoil ferry back to Tokyo, I was sorry my time had already come to an end, but I promised myself I would return to visit lovely Oshima again. Susan Spann is the author of the Hiro Hattori mystery novels. She lives in Tokyo, but frequently travels across Japan, climbing mountains and seeking adventures off the beaten path. You can find her online at www.susanspann.com.